What costs $18 all in and looks awesome? 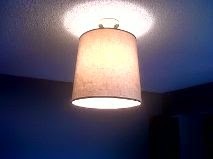 The "new" light fixture in my master bedroom! I spotted the lonely lampshade in Goodwill with the textured wallpaer (like grasscloth) and a cute velvet trim attached to the bottom. It was only $2! You heard me - two bucks! Add a $16 light kit from Home Depot and presto!